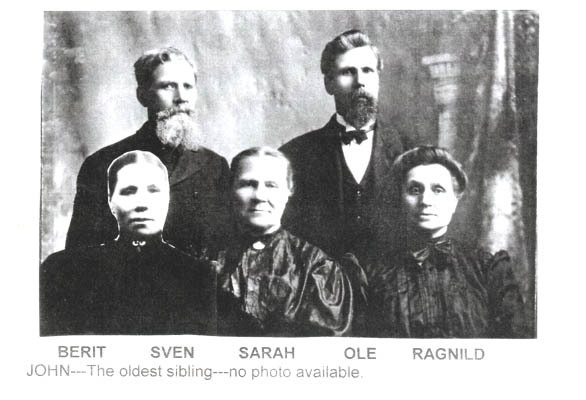 This page will discuss the family of Sven and Sigrid Berg Johnson, Father and mother to Iver Johnson. For additional family data sheets as we know it today please see the end of this page. 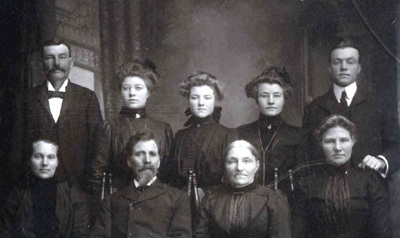 The pictures below are of the Sven Johnson family taken in 1912 to celebrate Sven's 75th. birthday. John S., Anna, Ida, Sarah, Iver S.
Julia, Sven, Sigri, John S.
Ida, Anna, Iver S., Rose, Sarah. The picture below Was provided Judy Godel (daughter of Sherman, grand daughter of Sven). 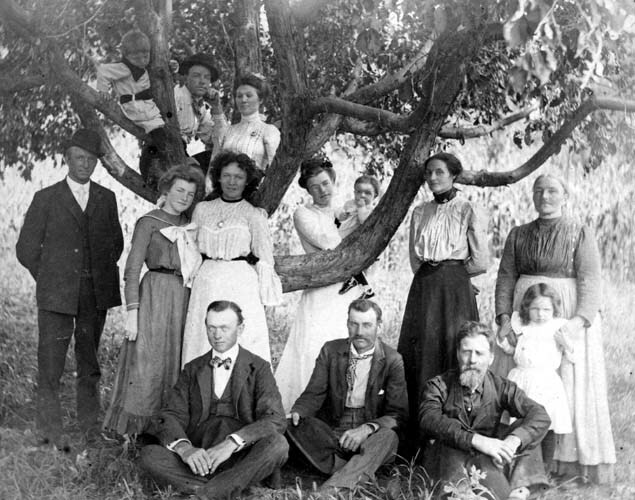 It is a picture of the Sven Johnson family taken August 10, 1902. Starting from the left in the first row sitting down: Unknown, John S., Sven. 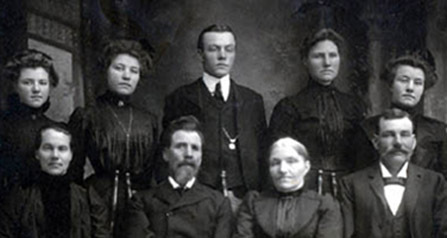 Standing from the left: unknown, Ida, unknown, Sarah holding Leonard (son of John S. and Mary Halverson), Mary Halverson (wife of John S.), Sigrid Berg (wife of Sven, holding Helen, daughter of John S.and Mary Halverson). In the tree: Sherman (son of John S. and Mary Halverson), Iver S., unknown. There is no date on the first picture of Sven below but it looks like he is about 50 years old. In the second picture he is 94 years old. The picture below was taken in 1931 at The funeral of Sven Johnson. The picture was provided by Paul Johnson, grandson of Ole Johnson. We have tried to identify the people in the picture but as of today we are still missing several names. Please advise if you recognize anyone not identified. Thanks for your help. There are several documents that give us information on Sven Johnson and his family. This includes the Stanton Register along with books and other publications of the times. "The full-rigged ship CLAUS HEFTY, 434 1/2 kml - ca 912 rgt. was built in Bath Me. in 1848. It was brought to Norway from Antwerp in 1864 by Fredrik Host, Sandefjord. It was sold to England in1873. The ship was engaged in the emigrant traffic." Sven Johannesen Haugen, age 30, along with his wife Sigri, age 24, and children Joran (Julia), age 3, and Johannes (John), age 1 1/2, sailed from Bergen, Norway aboard the good ship Claus Hefty on April 23, 1868.They were traveling with a group of family and friends to meet older brother John in Stanton County who had immigrated two years earlier. They arrived at Quebec City on June 14. From there they transfered to barges, and then railroad to Council Bluffs, Iowa which was as far west as the tracks had gone at that time. After crossing the Missouri River on a ferry, the last leg of the journey was made on loads of lumber drawn by brother John's oxen. John had arranged to meet them in Omaha. The total duration of their journey from Valdres to Stanton County was 16 weeks including seven weeks on the ocean. The following link showes a picture of the Claus Hefty along with more information about its construction and the voyage. There is a book titled: "FRONTIER MOTHER", The letters of Gro Svendsen, Arno Press, 1979, that is a collections of letters written home to family in Norway by a young woman who made the same journey to Iowa at almost the same time, 1862. It is a good reference of what the journey was like if you are interested. A possible source would be the Norwegian-American Historical Association and the library at St. Olaf College, Northfield, Minnesota. Another book I can recommed is: "Giants in the Earth" by O.E. Rolvaag. It is written about the early Norwegian settlers in the mid-west. “With my wife and two small children I reached Omaha, Nebraska, June26, 1868. We came direct from Norway, having crossed the stormy Atlantic in a small sailboat, the voyage taking eight weeks. A brother, who had settled in Stanton County, 107 miles from Omaha, had planned to meet us in that city. After being there a few days this brother, together with two other men, arrived and we were very happy. With two yoke of oxen and one team of horses, each hitched to a load of lumber, we journeyed from Omaha to Stanton County. Arriving there, we found shelter in a small dugout with our brother and family, where we remained until we filed on a homestead and had built a dugout of our own. We had plenty of clothing, a good lot of linens and homespun materials, but these and ten dollars in money were all we possessed. The land office was at Omaha and it was necessary for me to walk there to make a filing. I had to stop along the way wherever I could secure work, and in that way got some food, and occasionally earned a few cents, and this enabled me to purchase groceries to carry back to my family. There were no bridges across rivers or creeks and we were compelled to swim; at one time in particular I was very thankful I was a good swimmer. A brother-in-law (this may have been Sarah’s husband Halver Halverson) and myself had gone to Fremont, Nebraska, for employment, and on our return we found the Elkhorn river almost out of its banks. This frightened my companion, who could not swim, but I told him to be calm, we would come to no harm. I took our few groceries and our clothing and swam across, then going back for my companion, who was a very large man, I took him on my back and swam safely to the other shore. While I was away, my family would be holding down our claim and taking care of our one cow. We were surrounded by Indians, and there were no white people west of where we lived. In the fall of 1868 we secured a yoke of oxen, and the following spring hauled home logs from along the river and creek and soon had a comfortable log house erected. The following is the obituary for Sven Johnson published in the Stanton Register October 29, 1931. 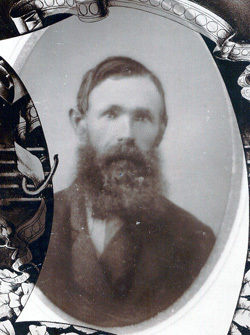 Sven Johnson ws born in Norde Aurdal, Valdres, Norway, October 14, 1837 and died at his farm home southwest of Stanton October 18, 1931, being 94 years and four days old. Mr. Johnson was twice married, his first wife died leaving a baby girl now Mrs. Julia Anderson of Newman Grove. In 1865 he was united in marriage to Sigri Berg and to this union were born six children, Mrs. Johnson died in 1912 and the oldest son, John S. Johnson died in 1921. In 1868, Mr. and Mrs. Johnson with two small children, immigrated to America, coming directly to Stanton County, where they homesteaded on the farm which has since been the family home. The voyage from Norway was made by sailboat, the trip from Valdres, Norway to Stanton taking 16 weeks. The railway extending only as far as Council Bluffs, Iowa. And after crossing the Nissouri river on a ferry, the trip to Stanton County was made on loads of lumber drawn by oxen droven by Mr. Johnson’s brother, John, who had driven to Omaha to meet the new comers. twenty-four grand children; and twenty-one great grand children, besides a host of other relatives and friends, who also survive and nourn his loss. 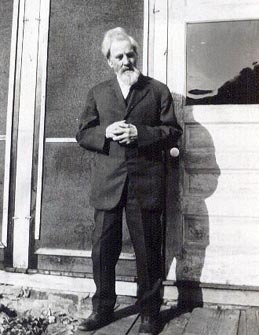 Mr. Johnson was a life-long member of the Luthern church and at and early age felt the call to serve his Master as Layman. After coming to the U.S. he traveled quite extensively as a home missionary among the Noregian Lutheran people in S. D., northern Nebraska and northwestern Iowa. He continued in this work until too feeble. Th large attendance at the funeral and the many floral tributes bespoke the respect in which he was held in the community. 3. Sven Johannesen (Johnson) (1837 – 1931). m. 1860 Jorand Olsdatter (1835 - 1865). m. 1866 Sigrid Berg (1844 – 1912) second wife emigrated to Stanton County 1868.